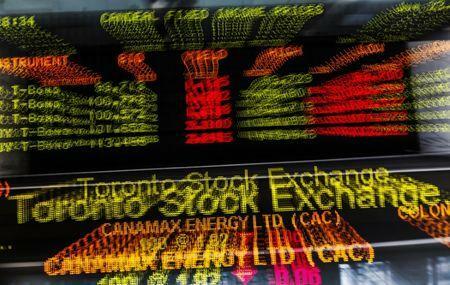 NEW YORK (Reuters) - The Toronto Stock Exchange's S&P/TSX <.GSPTSE> fell 90.47 points, or 0.55 percent, to 16,326.51. * Leading the index were Pretium Resources Inc , up 19.4 percent, Enerflex Ltd , up 9.4 percent, and Ritchie Bros. Auctioneers Inc , higher by 8.7 percent. * Lagging shares were Nuvista Energy Ltd , down 10.7 percent, Uni-Select Inc , down 6.6 percent, and Bausch Health Companies Inc , lower by 5.3 percent. * On the TSX 78 issues advanced and 162 declined as a 0.5-to-1 ratio favored decliners. There were 9 new highs and 7 new lows, with total volume of 181.0 million shares. * The most heavily traded shares by volume were Bombardier Inc , Aurora Cannabis Inc and Enbridge Inc .
* The TSX's energy group <.SPTTEN> rose 0.22 points, or 0.11 percent, while the financials sector <.SPTTFS> slipped 1.81 points, or 0.59 percent. * The TSX is up 0.7 percent for the year.